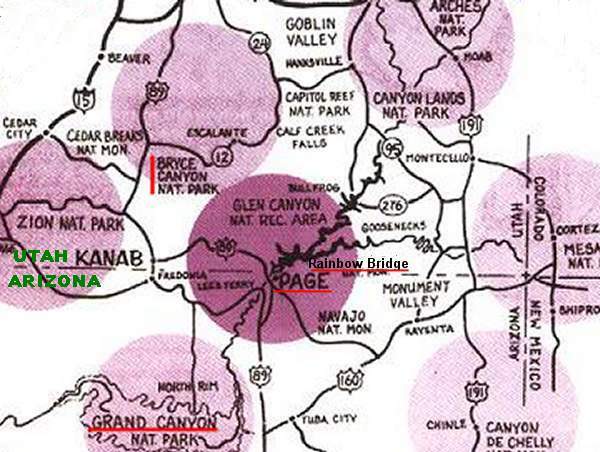 The Rainbow Bridge is located at Lake Powell (see itinerary stage 7 / regional map). From Page it is a 5 hours boat trip to get to the bridge and back including the visit. 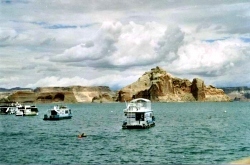 You'll enjoy a fascinating trip sailing round countless rock formations, that jut out from the water. 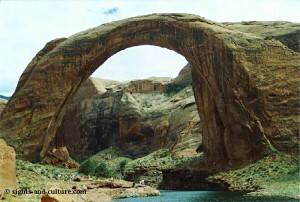 By its wondrous size, to say nothing of its majesty and mystery, Rainbow Bridge has inspired humans throughout time. For native Americans in this region it is a sacred site. Thousands of people from all over the world have visited this monument each year. From the base up to the top of its arch it is 290 feet and spans 275 feet across the river. The top of the arch is 42 feet thick and 33 feet wide.